For other uses, see Hiking (sailing) and Backpacking (wilderness). "Tramping" redirects here. For other uses, see Tramping (disambiguation). Hiking is the preferred term, in Canada and the United States, for a long, vigorous walk, usually on trails (footpaths), in the countryside, while the word walking is used for shorter, particularly urban walks. On the other hand, in the United Kingdom, and the Republic of Ireland, the word "walking" is acceptable to describe all forms of walking, whether it is a walk in the park or backpacking in the Alps. The word hiking is also often used in the UK, along with rambling (a slightly old-fashioned term), hillwalking, and fell walking (a term mostly used for hillwalking in northern England). The term bushwalking is endemic to Australia, having been adopted by the Sydney Bush Walkers club in 1927. In New Zealand a long, vigorous walk or hike is called tramping. It is a popular activity with numerous hiking organizations worldwide, and studies suggest that all forms of walking have health benefits. Hiking sometimes involves bushwhacking and is sometimes referred to as such. This specifically refers to difficult walking through dense forest, undergrowth, or bushes, where forward progress requires pushing vegetation aside. In extreme cases of bushwhacking, where the vegetation is so dense that human passage is impeded, a machete is used to clear a pathway. The Australian term bushwalking refers to both on and off-trail hiking. 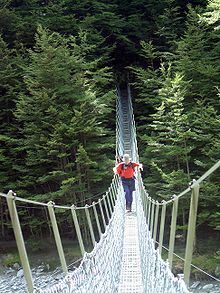 Common terms for hiking used by New Zealanders are tramping (particularly for overnight and longer trips), walking or bushwalking. Trekking is the preferred word used to describe multi-day hiking in the mountainous regions of India, Pakistan, Nepal, North America, South America, Iran, and the highlands of East Africa. Hiking a long-distance trail from end-to-end is also referred to as trekking and as thru-hiking in some places. In North America, multi-day hikes, usually with camping, are referred to as backpacking. The idea of taking a walk in the countryside for pleasure developed in the 18th century, and arose because of changing attitudes to the landscape and nature associated with the Romantic movement. In earlier times walking generally indicated poverty and was also associated with vagrancy. to encourage the taste of visiting the lakes by furnishing the traveller with a Guide; and for that purpose, the writer has here collected and laid before him, all the select stations and points of view, noticed by those authors who have last made the tour of the lakes, verified by his own repeated observations. To this end he included various 'stations' or viewpoints around the lakes, from which tourists would be encouraged to enjoy the views in terms of their aesthetic qualities. Published in 1778 the book was a major success. 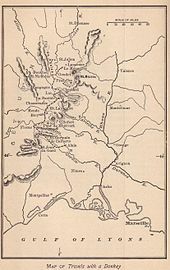 Map of Robert Louis Stevenson's walking route in the Cévennes, France , taken from Travels with a Donkey in the Cévennes (1879), a pioneering classic of outdoor literature. Another famous early exponent of walking for pleasure, was the English poet William Wordsworth. In 1790 he embarked on an extended tour of France, Switzerland, and Germany, a journey subsequently recorded in his long autobiographical poem The Prelude (1850). His famous poem Tintern Abbey was inspired by a visit to the Wye Valley made during a walking tour of Wales in 1798 with his sister Dorothy Wordsworth. 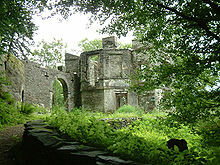 Wordsworth's friend Coleridge was another keen walker and in the autumn of 1799, he and Wordsworth undertook a three weeks tour of the Lake District. John Keats, who belonged to the next generation of Romantic poets began, in June 1818, a walking tour of Scotland, Ireland, and the Lake District with his friend Charles Armitage Brown. More and more people undertook walking tours through the 19th century, of which the most famous is probably Robert Louis Stevenson's journey through the Cévennes in France with a donkey, recorded in his Travels with a Donkey (1879). Stevenson also published in 1876 his famous essay "Walking Tours". The subgenre of travel writing produced many classics in the subsequent 20th century. An early American example of a book that describes an extended walking tour is naturalist John Muir's A Thousand Mile Walk to the Gulf (1916), a posthumous published account of a long botanizing walk, undertaken in 1867. Due to industrialisation in England, people began to migrate to the cities where living standards were often cramped and unsanitary. They would escape the confines of the city by rambling about in the countryside. However, the land in England, particularly around the urban areas of Manchester and Sheffield, was privately owned and trespass was illegal. Rambling clubs soon sprang up in the north and began politically campaigning for the legal 'right to roam'. One of the first such clubs, was 'Sunday Tramps' founded by Leslie White in 1879. The first national grouping, the Federation of Rambling Clubs, was formed in London in 1905 and was heavily patronized by the peerage. Access to Mountains bills, that would have legislated the public's 'right to roam' across some private land, were periodically presented to Parliament from 1884 to 1932 without success. Finally, in 1932, the Rambler’s Right Movement organized a mass trespass on Kinder Scout in Derbyshire. Despite attempts on the part of the police to prevent the trespass from going ahead it was successfully achieved due to massive publicity. However the Mountain Access Bill that was passed in 1939 was opposed by many walkers' organizations, including The Ramblers, who felt that it did not sufficiently protect their rights, and it was eventually repealed. The effort to improve access led after World War II to the National Parks and Access to the Countryside Act 1949, and in 1951 to the creation of the first national park in the UK, the Peak District National Park. The establishment of this and similar national parks helped to improve access for all outdoors enthusiasts. The Countryside and Rights of Way Act 2000 considerably extended the right to roam in England and Wales. Thoreau walked 34 miles (55 km) to Mount Wachusett, shown here. An early example of an interest in hiking in the United States, is Abel Crawford and his son Ethan's clearing of a trail to the summit of Mount Washington, New Hampshire in 1819. This 8.5 mile path is the oldest continually used hiking trail in the United States. The influence of British and European Romanticism reached North America through the transcendentalist movement, and both Ralph Waldo Emerson (1803–82) and Henry David Thoreau (1817-62) were important influences on the outdoors movement in North America. Thoreau's writing on nature and on walking include the posthumously published "Walking" (1862)". His earlier essay "A Walk to Wachusett" (1842) describes a four-day walking tour Thoreau took with a companion from Concord, Massachusetts to the summit of Mount Wachusett, Princeton, Massachusetts and back. In 1876 the Appalachian Mountain Club, America’s earliest recreation organization, was founded to protect the trails and mountains in the northeastern United States. The Scottish-born, American naturalist John Muir (1838 –1914), was another important early advocate of the preservation of wilderness in the United States. He petitioned the U.S. Congress for the National Park bill that was passed in 1890, establishing Yosemite and Sequoia National Parks. The Sierra Club, which he founded, is now one of the most important conservation organizations in the United States. The spiritual quality and enthusiasm toward nature expressed in his writings inspired others, including presidents and congressmen, to take action to help preserve large areas of undeveloped countryside. He is today referred to as the "Father of the National Parks". In 1916, the National Park Service was created to protect national parks and monuments. In 1921, Benton MacKaye, a forester, conceived the idea of the America's first National trail, the Appalachian trail, and this was completed in August 1937, running from Sugarloaf Mountain in Maine to Georgia. The Pacific Crest Trail ("PCT") was first explored in the 1930s by the YMCA hiking groups and was eventually registered as a complete border to border trail from Mexico to Canada. See also: National Park; National Parks of England and Wales; of Canada; of New Zealand, of South Africa, etc. In Continental Europe amongst the most popular areas for hiking are the Alps, and in the United Kingdom the Lake District, Snowdonia, and the Scottish Highlands. In the US the National Park system generally is popular, whereas in Canada the Rockies of Alberta and British Columbia are the most popular hiking areas. The most visited hiking area in Asia is probably Nepal. The Inca Trail to Machu Picchu is possibly the most hiked short trail in South America. Frequently nowadays long-distance hikes (walking tours) are undertaken along long-distance paths, including the National Trails in England and Wales, the Kungsleden (Sweden) and the National Trail System in the United States. The Grande Randonnée (France), Grote Routepaden, or Lange-afstand-wandelpaden (Holland), Grande Rota (Portugal), Gran Recorrido (Spain) is a network of long-distance footpaths in Europe, mostly in France, Belgium, the Netherlands and Spain. There are extensive networks in other European countries of long-distance trails, as well as in Canada, Australia, New Zealand, Nepal, and to a lesser extent other Asiatic countries, like Turkey, Israel, and Jordan. In the Alps of Austria, Slovenia, Switzerland, Germany, France, and Italy walking tours are often made from 'hut-to-hut', using an extensive system of mountain huts. 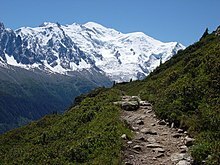 In the late 20th-century there has been a proliferation of official and unofficial long-distance routes, which mean that hikers now are more likely to refer to using a long-distance way (Britain), trail (US), The Grande Randonnée (France), etc., than setting out on a walking tour. Early examples of long-distance paths include the Appalachian Trail in the US and the Pennine Way in Britain. Pilgrimage routes are now treated, by some walkers, as long-distance routes, and the route taken by the British National Trail the North Downs Way closely follows that of the Pilgrims' Way to Canterbury. Proponents of ultralight backpacking argue that long lists of required items for multi-day hikes increases pack weight, and hence fatigue and the chance of injury. Instead, they recommend reducing pack weight, in order to make hiking long distances easier. Even the use of hiking boots on long-distances hikes is controversial among ultralight hikers, because of their weight. Hiking times can be estimated by Naismith's rule or Tobler's hiking function, while distances can be measured on a map with an opisometer. A pedometer is a device that records the distance walked. Natural environments are often fragile, and may be accidentally damaged, especially when a large number of hikers are involved. For example, years of gathering wood can strip an alpine area of valuable nutrients, and can cause deforestation; and some species, such as martens or bighorn sheep, are very sensitive to the presence of humans, especially around mating season. Generally, protected areas such as parks have regulations in place to protect the environment, so as to minimize such impact. Such regulations include banning wood fires, restricting camping to established camp sites, disposing or packing out faecal matter, and imposing a quota on the number of hikers. Many hikers espouse the philosophy of Leave No Trace, following strict practices on dealing with food waste, food packaging, and other impact on the environment. Human feces are often a major source of environmental impact from hiking, and can contaminate the watershed and make other hikers ill. 'Catholes' dug 10 to 25 cm (4 to 10 inches) deep, depending on local soil composition and covered after use, at least 60 m (200 feet) away from water sources and trails, are recommended to reduce the risk of bacterial contamination. Fire is a particular source of danger, and an individual hiker can have a large impact on an ecosystem. For example, in 2005, a Czech backpacker started a fire that burnt 5% of Torres del Paine National Park in Chile by knocking over a portable stove. Because hikers may come into conflict with other users of the land, hiking etiquette has developed. When two groups of hikers meet on a steep trail, a custom has developed in some areas whereby the group moving uphill has the right-of-way. Various organizations recommend that hikers generally avoid making loud sounds, such as shouting or loud conversation, playing music, or the use of mobile phones. However, in bear country, hikers use noise as a safety precaution. The Leave No Trace movement offers a set of guidelines for low-impact hiking: "Leave nothing but footprints. Take nothing but photos. Kill nothing but time. Keep nothing but memories". Various organizations advise hikers not to feed wild animals, because this can harm the animals and endanger other people. Additional potential hazards involving physical ailments may include dehydration, frostbite, hypothermia, sunburn, or sunstroke, or such injuries as ankle sprains, or broken bones. Other threats may be posed attacks by animals (such as mammals (e.g., bears), reptiles (e.g., snakes), or insects) or contact with noxious plants that can cause rashes (e.g., poison ivy, poison oak, poison sumac, or stinging nettles). Attacks by humans are also a reality in some places, and lightning is also a threat, especially on high ground. An elk attacking a tourist in the Grand Canyon, USA. The crossing of glaciers is potentially hazardous because of the potential for crevasses. These giant cracks in the ice are not always visible as snow can be blown and freeze over the top to make a snowbridge. To cross a glacier the use of a rope, crampons and ice axes are usually required. Deep, fast flowing rivers pose another danger that can be mitigated with ropes. In various countries, borders may be poorly marked. In 2009, Iran imprisoned three Americans for hiking across the Iran-Iraq border. It is illegal to cross into the US on the Pacific Crest Trail from Canada. Going south to north it is more straightforward and a crossing can be made, if advanced arrangements are made with Canada Border Services. Within the Schengen Area, which includes most of the E.U., and associated nations like Switzerland and Norway, there are no impediments to crossing by path, and borders are not always obvious. Fell running – the sport of running over rough mountainous ground, often off-trail. Fastpacking – a marriage of running and backpacking. ^ H. W. Orsman, The Dictionary of New Zealand English. Auckland: Oxford University Press, 1999. ISBN 0-19-558347-7. ^ McKinney, John (2009-03-22). "For Good Health: Take a Hike!". Miller-McCune. Archived from the original on 2011-04-29. ^ "A Step in the Right Direction: The health benefits of hiking and trails" (PDF). American Hiking Society. Retrieved 1 June 2012. ^ a b c d Keller, Kristin T. (2007). Hiking. Capstone Press. ISBN 0-7368-0916-3. ^ "Bushwalking Australia home". Bushwalking Australia. Retrieved 2016-03-18. ^ H. W. Orsman, The Dictionary of New Zealand English. Auckland: Oxford University Press, 1999. ^ Mueser, Roland (1997). Long-Distance Hiking: Lessons from the Appalachian Trail. McGraw-Hill. ISBN 0-07-044458-7. ^ The Norton Anthology of English Literature, ed. M. H. Abrams, vol.2 (7th edition) (2000), p. 9-10. ^ Rebecca Solnit, Wanderlust: A History of Walking. New York: Penguin Books, 2000, p.83, and note p.297. ^ West. A Guide to the Lakes. p. 2. ^ "Development of tourism in the Lake District National Park". Lake District UK. Archived from the original on October 11, 2008. Retrieved 2008-11-27. ^ "Understanding the National Park — Viewing Stations". Lake District National Park Authority. Archived from the original on 2014-01-04. Retrieved 2008-11-27. ^ Stephenson, Tom (1989). Forbidden Land: The Struggle for Access to Mountain and Moorland. Manchester University Press. p. 78. Retrieved 2013-02-07. ^ Stephenson, T.; Holt, A.; Harding, M. (1989). "The 1939 Access to Mountains Act". Forbidden Land: The Struggle for Access to Mountain and Moorland. Manchester University Press. ISBN 978-0-7190-2966-0. ^ "Kinder Trespass. A history of rambling". Archived from the original on 2012-07-08. Retrieved 2013-12-17. ^ Condensed Facts About Mount Washington, Atkinson News Co., 1912. ^ Thoreau, Henry David. "Walking" (June 1862). The Atlantic. Retrieved 24 July 2017. ^ "The Life and Contributions of John Muir". Sierra Club. Retrieved October 23, 2009. ^ Miller, Barbara Kiely (2008). John Muir. Gareth Stevens. p. 10. ISBN 0836883187. ^ "The Top 10 Hiking Trails in the US". e2e.com. Archived from the original on 2014-02-23. Retrieved 2014-02-12. ^ Mountaineering: The Freedom of the Hills (6th ed.). The Mountaineers. 1997. pp. 35–40. ISBN 0-89886-427-5. ^ "Ten Essential Groups Article". Texas Sierra Club. Archived from the original on 2011-05-07. Retrieved 2011-01-19. ^ a b c Cole, David. "Impacts of Hiking and Camping on Soils and Vegetation: A Review" (PDF). Archived from the original (PDF) on 2010-07-06. ^ "Chilean park recovering from fire". Daily Mail. 2005-05-25. Archived from the original on 2011-02-11. ^ a b Devaughn, Melissa (April 1997). "Trail Etiquette". Backpacker Magazine. Active Interest Media, Inc. p. 40. ISSN 0277-867X. Retrieved 22 January 2011. ^ Boulware, D.R. ; et al. (2003). "Medical Risks of Wilderness Hiking". American Journal of Medicine. 114 (4): 288–93. doi:10.1016/S0002-9343(02)01494-8. PMID 12681456. ^ Goldenberg, Marni; Martin, Bruce (2007). Hiking and Backpacking. Wilderness Education Association. p. 104. ISBN 0-7360-6801-5. ^ Gordon, Michael R.; Lehren, Andrew W. (2010-10-23). "Iran Seized U.S. Hikers in Iraq, U.S. Report Asserts". New York Times. Amata, Joseph, On Foot, A History of Walking. New York: New York University Press, 2004. Gros, Frédéric. A Philosophy of Walking, trans. by John Howe. London, New York: Verso, 2014. Solnit, Rebecca, Wanderlust: A History of Walking. London: Penguin Books, 2001. Wikivoyage has a travel guide for Hiking. Look up hiking in Wiktionary, the free dictionary.